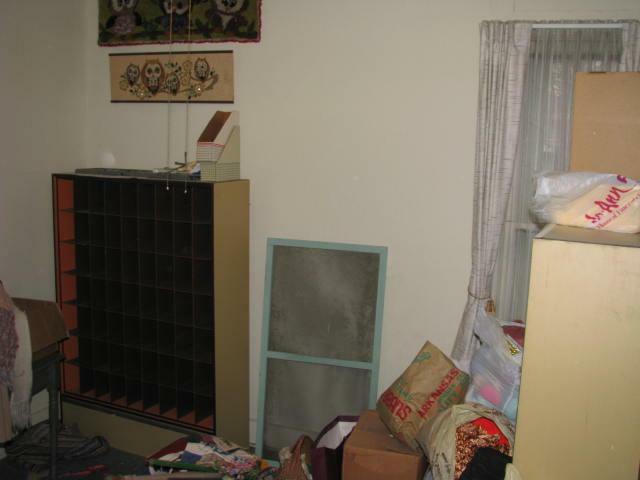 The room started out as a mess, just like every other room in the house. There were holes in the walls, an old outside entrance with a rotted door and rotted frame, blue 9X9 tiles on the floor and a closet full of mold and rotted wallpaper. And this was just the beginning. This is the very beginning. A room full of trash, covering all of the imperfections. You can see the corner window on the right, covered by some curtains. 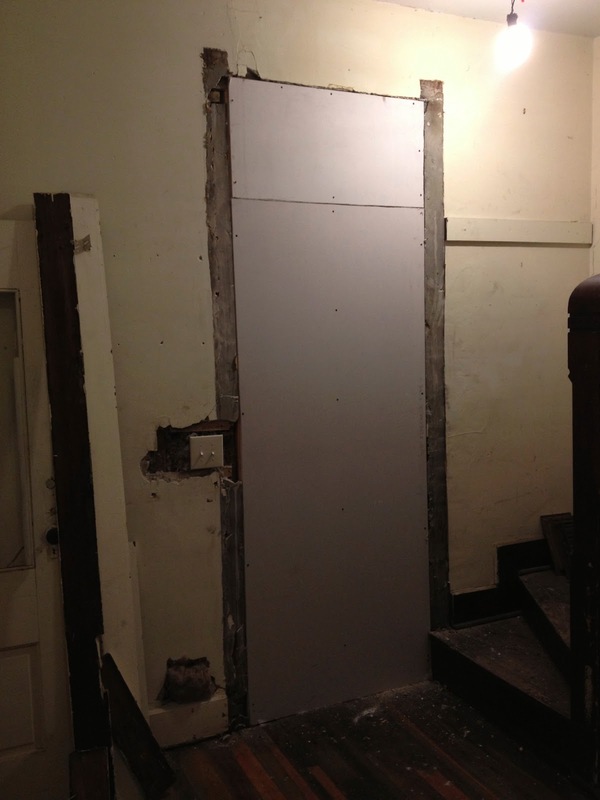 After we cleaned it up, original door on the right. Another angle, from the staircase. After taking out the door, framing the wall back in, adding insulation and then drywalling. We ripped up all the tiles and then found the same layer of glue and black tar paper I've mentioned previously on the blog. It was a huge, tedious job to say the least. This is taken from the top of the stairs and shows as much of the room in one shot as I could get. :) The work on Leo's room was extensive. Besides removing the door and restoring the floors, we rebuilt the entire closet, drywalled many of the walls, fixed existing baseboard and installed new baseboard, put in all new quarter round, painted the walls, closet, door, baseboard and quarter round, replaced the window, fixed the window above his door, updated the electrical and restored the staircase. Believe it or not, I still have a little work left to do in this room (hang fixtures, replace some floorboards and hang lights). From the yellow chair, we have this beautiful view of an old grand staircase that we fully restored back to it's original state. 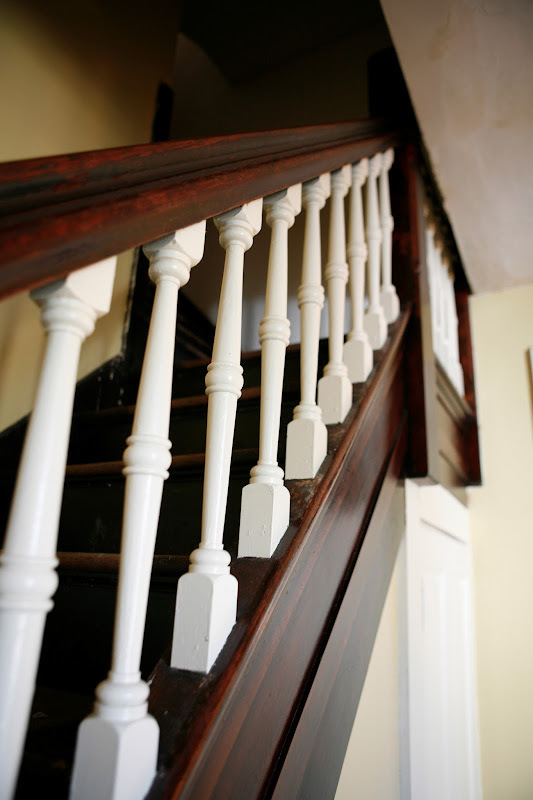 We sanded and chiseled every inch of it and then painted the spindles white and stained the original oak trim to match the rest of the downstairs. Closet door on right. Couldn't resist another staircase shot of the spindles, plus you can see the closet in the bottom right. You can see I still have some staining to do! We found this solid cherry dresser at Salvation Army, the perfect match to a cherry colored staircase. Handmade wooden city blocks and whale courtesy of my awesomely talented sister, who runs Little Adventure Toys. Lots more before and after shots to come! And a birthday post for my sweet boy turning 1.
nice work, stud muffins! wish you could have us over for dinner! :D HAPPY BIRTHDAY, LEO!! 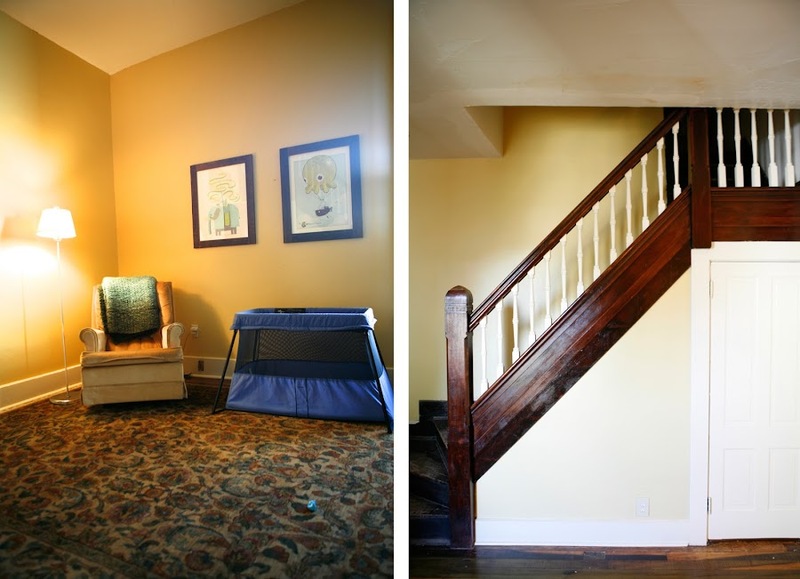 The transformation of his room is amazing! You two have done a tremendous job getting this ole' house back into shape. Looking forward to celebrating Leo this week. Love that little guy. Amazing you guys! It looks so beautiful! I love the room. I can't wait to see it all in person.